As you know, Virginia is a pretty conservative state and as you can imagine there is currently a tremendous amount of complaining and griping about Obama’s stimulus package and how it’s just a waste of money and is causing the federal deficit to explode. As I see it, one of the big problems is that there is absolutely no PR campaign that tells people where the stimulus money is going. If you have the time and energy you can find it on the Internet but there is nothing on site or on location that announces it as a stimulus project. Every day for the past few months, I drive through or by a road project that is being funded by the stimulus package. 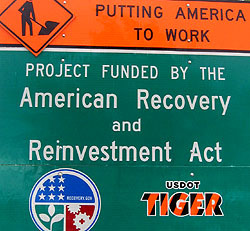 But there is not a single sign or banner that announces it is an American Recovery and Reinvestment Act project. I’ll bet you that 95% of the people who drive by this road project have no idea where the money for it came from. The local papers don’t even talk about it. Is this something unique to Virginia or are the funds being spent invisibly across the country? If that’s the case, it’s a huge mistake and it ought to be fixed ASAP (i.e. well before November). I’d say that’s true where I live too. Every local road project has plenty of signage telling us who’s paying for it, but federal dollars are pretty hard to identify. There are occasional ARRA signs, but not many. How about in your neck of the woods? Are most projects (construction or otherwise) getting federal dollars signed so that people know about it? Or not?